Róbert Oláh-Gál, Babes-Bolyai Science University, Cluj, University of Csíkszered published an article "Janos Bolyai's birth house and original grave", Műszaki Szemle 30 (2005), 4-12. This appeared in the Hungarian-language journal of the Hungarian Technical Scientific Society of Transylvania which has been published four times a year since 1998. They have produced a number of Historia Scientiarum parts since 2004 and this paper appears in the second of these, published in 2005. The translation below is by University of St Andrews undergraduate Kamilla Rekvenyi. He went to Transylvania from Hungary, to the University of Cluj, and the celebration of Janos Bolyai's 100th year jubilee took place during his deanship. He was the one who represented the Academy (Hungarian Science Academy, MTA) at the exhumation and reburial of the two Bolyais. These events naturally directed his attention to the Bolyais. Due to his scientific attitude he knew that it was his obligation to keep all written documents in relation to both of the Bolyais and search for more. Naturally he completed this research and collecting in Cluj, where he spent the bulk of his life as a university teacher. This was around the time Lajos Schlesinger, his erudite colleague, finished the search for the birth house of Janos Bolyai in Cluj. So it is obvious that Gyula Farkas was eager to look for and collect the documents in connection to this, especially because the finding and identifying of the birth house was not even close to being complete and certain. This might be the reason, one that the Bolyai-researchers have not mentioned before, that Gyula Farkas collected 31 documents related to the birth house of Janos Bolyai. Our goal was to review all of these and give posterity's gratitude to Gyula Farkas, as a Bolyai-researcher. In the following we will introduce and comment on three of these documents. The following nice story relates what happened almost 200 years ago in Kolozsvár. The main character is the senator of the free royal town of Kolozsvár, Mihály Szentkirályi, from Komjátszeg. The suffering subjects are the great Bolyais and the theme is an arable land next to the Szamos River. The first wife of Farkas Bolyai was Zsuzsanna Benkő, and his mother-in-law was Mrs József Benkő, born as Julianna Bachmann. Jozsef Benkő chirurgus (surgeon in latin) and Julia Bachmann had six children, four sons and two daughters, Julianna and Zsuzsanna. Julianna Benkő, older sister of Zsuzsanna Benkő, became a widow very early on, and married Lajos Székely, a lawyer from Marosvásárhely shortly after that. So Mrs Lajos Székely, Julianna Benkő was Farkas Bolyai's sister-in-law, and János Bolyai's aunt. Lajos Székely and Julianna Benkő had a daughter called Mária, who married Dániel Hints, a citizen of Marosvásárhely. Mrs Dániel Hints, born as Mária Székely, was the first cousin of János. She might have passed away in 1910 and I believe she was the most trustworthy source, who luckily told many things to his son, chief physician Elek Hints, about the daily life of János Bolyai. It is very interesting how János Bolyai remembers his grandparents from Kolozsvár. The father of my grandfather, on my mother's side, András Bachmann, was a button binder from Kolozsvár. One of my ancestors from my mother's side was a Saxon priest from Nagycsőr, hence there is some Saxon blood in me, and all my life and hard work was mainly supported by that Saxon blood, but more importantly, as my father used to say, the Hungarian fire - with some exceptions - just like the fires from the straws. The house of my grandmother, from my mother's side, was in the Közép (middle) Street in Kolozsvár, opposite the Minorites, the corner of the alley, and neighboring the house of Baroness Alvici. It was a two-floored house, in the first floor lived the director of National Architecture; it was bought by an Armenian in the end. They had a 8000 german forints worth farm, next to the Szamos River. Upon a probably 300 bushels, great land - right next to the borders of the city - my widow grandmother wanted to take a mortgage to Senator Szentkirályi, who became chief judge later on and died in cholera. This added a heartbreaking twist to the seller's note: the land was lost. But what was the twisted part of the senator's letter? Interestingly, the great scientist, Gyula Farkas is to be thanked for the fact that now we know the answer. Gyula Farkas wasn't only a great scientist and science coordinator, but he was one of the most humble Bolyai-researcher as well. Since he lived in Kolozsvár, he considered it his obligation to gather all the documents about the Bolyais. This is how he could acquire this deed as well, whose original is in the MTA Archive Bolyai Collection, as the donation of Gyula Farkas. By signing my name I indicate that I agree to the following conditions. If the notable  Professor Farkas Bolyai and his dear partner of life, Susánna T. Benkő would like to keep the arable lands, that the widow of the late Mr József Benkő, born as Julianna Bakmán swapped with me on this day, they need to pay for it all in cash to me, any time until the last day of this year. After this year goes by, if the conditions have not met, there are no obligations towards me. I therefore state in writing that the original of the Copia above is in my possession. Therefore, it seems that the Senator, rented the great "300 bushel of land" by the Szamos River, with the condition, that widowed Mrs Benkő, Julianna Bachmann either pays for the land in that year, or never. I even dare to think, that the senator wrote this letter with Sámuel Késmárki, or (which is even more believable), since Julianna Bachman was illiterate, he convinced her to accept the deal, without sharing all of its content with her. We cannot hear this sound. The neighbourhood doesn't start a fight. I believe János Bolyai had never seen the original settlement, or the authentic copy of Chancellor Samuel Késmárki. However, just like the details of the quote from him, he knew this very well too. He was aware of his family's social and economical status both on his mother's, and father's (the Bolyai) side. He was a proud member of this famous citizen family from Kolozsvár, and the impoverished primae occupationalis  Bolyai family. It was hurtful for János Bolyai that from the thousands of forints from his mother's legacy, he only inherited 300, but he also accepted this. For the person who acquires and discovers the science of absolute space, an arable land near the Szamos River, cannot matter too much. As it will turn out in the following, the Benkő-house in Kolozsvár was bargained away for 12500 Rhine Forints (excluding the personalities)! The record of the auction below is a donation from the collection of Gyula Farkas. We can clearly conclude the way of the auction and the increase of the prices from it. With nobody bidding a greater amount, the house was sold to Mr Jakab Szenkovits. Signed by Commissioners László Magyari and József Mátéffi and Jakab Szenkovits . The following document is also a donation from Gyula Farkas to the MTA Archive's Bolyai Manuscript Collection. It is also part of the Benkő possessions. A lot of the wines of Surgeon Benkő also remained after his death. We are assuming wine was a common medicine he used in his treatments. Otherwise he would have kept it in the cellar and not between the gates. After his death a committee of auctioneers, whilst trying the wine, sold them to bidders. This is also a nice story of those old times! By signing our names, as witnesses, we indicate that we understand the following conditions. In this ongoing year, the worth of six new barrels of wine, among others, was lawfully evaluated, and we auctioned them on the 21st of April 1818. These wines were mediocre, and were not kept in the wine cellar; they were just between the gates. We tasted them in the order of their arrival. We believe the commissioner of Honourable Countess Elek Bethlen, was also present. All this, we grant with our truest belief, and therefore we hand you this writing as evidence. István Balós, the mentioned Fertály (Quarter) [...] for the above written reason [...] that I am also a wine holder, also can assure the truthfulness of the above. After the fermentation, if the wine is mature, it has to be decanted (pour the wine into another barrel), throw the marc away, or use it to make pálinka (strong Hungarian spirit). It is a possibility, that József Benkő's sudden death stopped him from dealing with his wine. The Mathematics and Science Faculty of the Royal Hungarian Ferentz József Tudományegyetem (Science University) has decided three years ago to find the house where János Bolyai was born, and label it with a commemorative plaque. This search was also supported by the noble City Council. The first traces lead us to a different house, which is the private property of Bálint Betegh, located on the other side of Deák Ferenc Street. At the time of János Bolyai's birth, the house of Pál Bodor, monetary inspector of the Transylvanian Province stood there. However, one of my fellow teachers identified that the house where János Bolyai was born is this, which is now in possession of the privileged Merchant Company, which was in at the time József Benkő's, János Bolyai's grandfather's from his mother's side. After this discovery, with permission from the Merchant Company, the faculty immediately implemented putting up the plaque. The plaque refers to János Bolyai as the Hungarian Euclid, since he was a constitutive master of geometry, just like Euclid. His father, Farkas Bolyai is also named on the plaque, since he deserves credit being a deep thinker and author of the Tentamen, and furthermore, for having an important role in perfecting János's talent. I am turning to Notable Mr Councillor, to ask for his instrumentality with total certainty, so that the public of the Free Royal City of Kolozsvár will treasure the memory of the birth of János Bolyai, and I am asking the noble City Council to protect the memorial stone for the eternal future. Antal Salamon took the plaque into the city's protection with enthusiastic words, and promised that the city would guard it with the highest piety. On the 15th of December 1802, János Bolyai was born here, the Hungarian Euclid, son of Farkas Bolyai, the deep thinking author of the Tentamen. Due to the hundred years memorial, the Mathematics and Science Faculty of the Royal Hungarian Ferentz József Science University of Kolozsvár places the stone here. Speech of Gyula Farkas, correspondent member, at the placement of János Bolyai's ashes next to his father's in Marosvásárhely, 7th July 1911. The Bolyais! A father, exploring the deep, and a son, finding facts in the distance. I honour your ashes on behalf of the Hungarian Science Academy. Here, diligent grace has brought your ashes together, since even though your relationship had its flaws: you belong together, not only by nature, but also by spirit. Since you moved to the land of eternal peace, the "together rooting and in its top joining tree of arithmetic and geometry" has been blooming, and it's growth has made your conceptions appreciated; the "Appendix, Scientiam Spatii absolute veram exhibens" has found great glory, and hence the great natural law of today, the law of laws, raises our thinking to a new space-time world, where the space of Bolyai's world gets under way. In the light of your glory, the Academy has commemorated your work in the Bolyai Foundation, so that the whole World knows that you, and your work, have made the notion of the Hungarian State significantly richer. 2. Where did János Bolyai's body turn to dust? 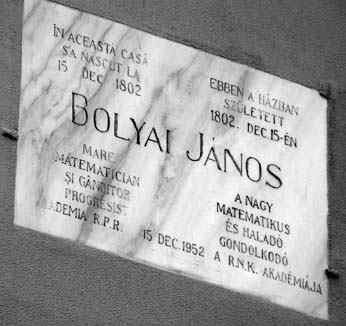 The grave of János Bolyai, famous mathematician, violinist and fencer had no sign for 34 years and it became undiscoverable, since nobody took care of it. He had no relatives nearby. Luckily, his loyal servant, Julis Szőcs is still alive, so she could show us the place, where János Bolyai's ashes are resting. Mr Ferenc Schmidt architect, has always turned to the Bolyais with great interest and in 1860, the year of J.B.'s death presented the two Bolyais to us. A year ago he came here, and was sad to see the desolation of J.B.'s grave. Thanks to his tireless diligence and procurement, a campaign started in the capital city circles and the Mathematics and Physics Society marked the grave of the author of "Appendix" with a simple, pretty tacky gravestone. Because of the favour they paid for science, through the giving a gravestone to a great worker of science, the Society deserves thankfulness and appreciation. The news bulletin above contains some inaccuracies, for example, that János Bolyai had no relatives nearby. Farkas Bolyai (II) did live in Marosvásárhely then, grandson of János Bolyai, father of Gáspár Bolyai (IX), who is still alive now. It is also not true that Ferenc Schmidt already presented the two Bolyais in 1860. However, the news is still true, that was the actually time they set the memorial stone up, that still stands at the head of János Bolyai's moved grave. Shall we mark the grave of János Bolyai? First account of the donations for János Bolyai's mausoleum. Szily Kálmán (5 forints), b. Eötvös Loránd (10), Kőnig Gyula (10), Bogyó Samu (2), Kürschák József (2), Heller Ágos(1), Réthy Mór (10), Dr. Kiss Károly (1), Fröhlich Izidor (5), Rados Ignácz (2), Csillag Vilmos (1), Csopey László (1), Held Károly (1), Rados Gusztáv (3), Suták József (1), Beke Manó (1), Hornischek Henrik (1), Wittmann Ferencz (2), Klupáthy Jen (2), Bein Károly (1), Kohányi Gyula (1), Gruber Nándor (1), Székely Károly (1), Fényes Dezső (2), Bodola Lajos (1), Balog Mór (1), Tangl Károly (1), Kövesligethy (1), Tőtössy Béla (3), Bélteky Albert (1), Kirchknopf András (1), Fraunhoffer Lajos (1), Osztrogonácz János (1), Hlatky Miklós (1), Koschowitz Gyula (2), Bartoniek Géza (1), Wagner Alajos (1), Szuppán Vilmos (1), Kleiszner Rezs_ (1), Kopp Lajos (2), Kiss Ernő János (1), Orbán Antal (1), Éberling József (1) Collected revenue so far: 90 forints. Even though, the Mathematics and Physics Society made a promise, that the names of the people who made donations later on will also be published, this did not happen. At least my research so far suggests that, since the later publications of the Mathematics and Physics Society contain no such data. I believe, Ferenc Schmidt took the matter into his own hands, paid for the rest and took initiative to direct the implementation. We could think that the Transylvanians did not know about this. Sadly, that would not be true, since around 10 years before, in 1884 they placed a gravestone on Farkas Bolyai's grave, made of beautiful, black marble, with money from the inhabitants of Marosvásárhely. There was a small amount remaining from that money, which could have been enough to finance a gravestone for János Bolyai, but the Bolyai Committee of the Lutheran School did not allow it. Here is a letter about this from József Koncz to Kálmán Szily. I am honoured to send you the data you asked for from the biography of János Bolyai - as his brother Gergely Bolyai wrote it down - in case these are not yet in Your Honour's possession. He was buried in the Lutheran Cemetery and his grave is not marked. I was hoping, that even a simple gravestone would be given to him, rather to his grave, for the occasion of the marking of his father's gravestone, but the Committee was not willing to do that - the remaining 100 forints from the collected money they wished to use as a scholarship called "Bolyai-fund", whose interest would be distributed as a reward for the best mathematics students of the last 4 classes of secondary school. So another ten years had to pass and a "stranger", Ferenc Schmidt needed to come to put up a gravestone for János Bolyai. The question remains; where was János Bolyai's original grave in the Lutheran Cemetery in Marosvásárhely? The answer is hard, since there were other people who have been buried in the same place since that time. What I know for a fact is that Dr Sándor Szilágyi, a doctor from Marosvásárhely, took a picture at the reburial in 1911. But could he have a living descendant who has the photograph or some record? A photographer from Marosvásárhely, Géza Csonka  also took a picture of the grave. In archives and journals from the time I found the following references regarding János Bolyai's original grave. We need to know that our János and Farkas Bolyai, people we'll be proud of forever, did not wish to rest next to each other when they turned to dust . The father was buried in the lower part of the Lutheran Cemetery in Marosvásárhely, and four year later the son was buried at the top of the hill. The one to do them justice, and put them next to each other was the Hungarian Science Academy in 1911. Károly Gulyás personally attended the reburial on the 7th June 1911. In the same year, 1911, a pious act took place in our cemetery, with the Hungarian Science Academy's initiative and expenditure, János Bolyai's, one of the most eminent figures of Hungarian science, ashes were replaced from the III panel of the cemetery to the grave of his father. Hence the remains of two geniuses, who were always standing against each other due to unlucky circumstances, even though they were connected by blood and spirit, are now resting in a joint grave. This grave is a destination for pilgrims who can appreciate the values of science. One of the originals of the reburial reports can be found in our archive. This is all the data we have to determine which one is János Bolyai's original grave. With the photo taken by Csonka, I have been walking around in the cemetery's III panel several times. 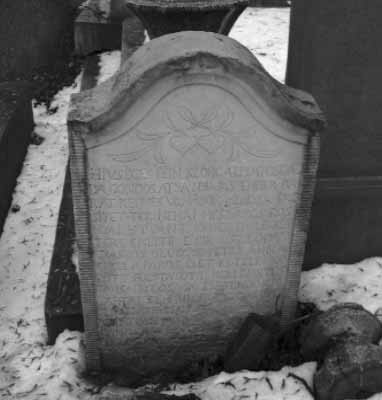 I was looking for an old grave that vaguely looks like the one on the photograph. Well, my luck and premonition stood by me, since I believe I found the gravestone, which stands behind János Bolyai's pillar tomb from 1894. This gravestone remained by chance, since further people buried on top of it and it leans to the new grave made of concrete. Fráter Jánosné: The Bolyai Collection (K 22 - K 30), Budapest, 1968. On the occasion of the 100th anniversary of János Bolyai's birth which was held on January 15, 1903, M. Kir. Kolozsvár, József Ferencz University Cluj-Napoca 1903. Ajtai K. Albert Bookstore, 71-72.p. MTA Library Handbook, Bolyai Collection. István Csekme: The Calvinist Burial of Târgu-Mureș in 1988. Târgu-Mureș, 1994. 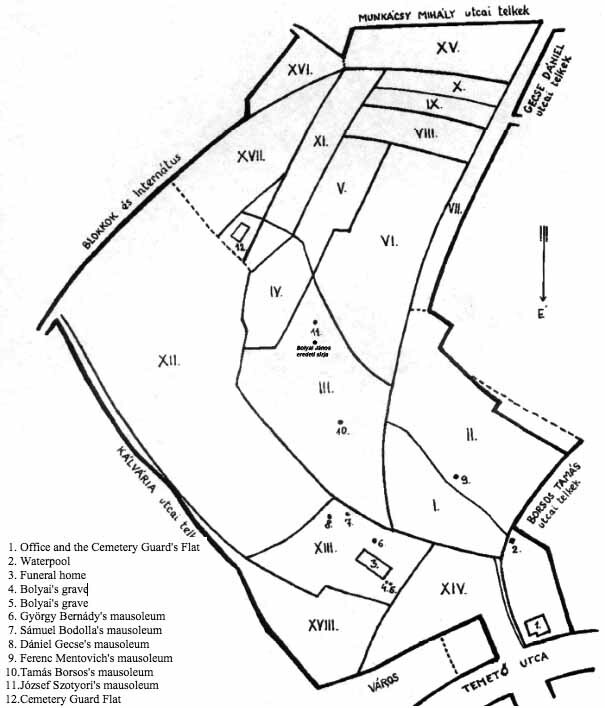 On the above sketch I marked the place in the III panel, where János Bolyai's original grave could have been. 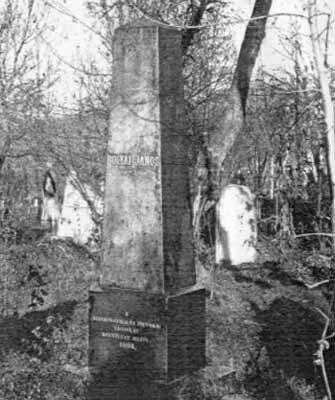 The white gravestone of butcher István Rosnyai on the picture is approximately two meters behind János Bolyai's.